Al Capone stayed at the Julien Dubuque Hotel when he was hiding from the Chicago cops. The way they tell it in that part of Iowa, Al Capone stayed at the Julien Dubuque Hotel when he was hiding from the Chicago cops. And now you can too, in the new Al Capone Suite. There better be Tommy guns in there for that price. Loaded. And maybe a couple of molls to keep you company. The Julien Dubuque is 150 years old, and just completed a $30 million renovation. "In the late 20's and 30's Al Capone did live in this hotel," hotel manager Mark Czeshinski told KCRG-TV in Cedar Rapids. "There is a rumor that he once owned the hotel. But we haven't figure out yet if that is true." For $499 a night - in Dubuque - it'd better be true. And what about that vault? The one near the kitchen? 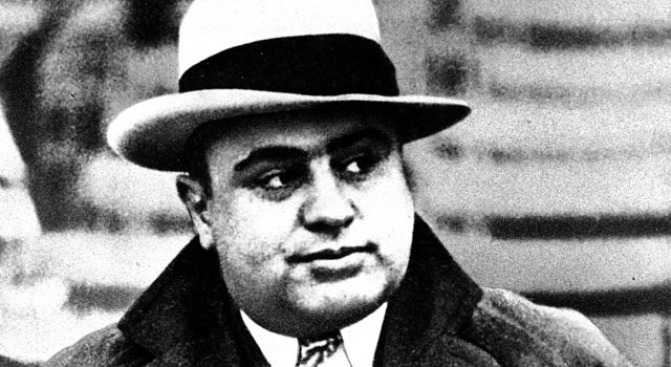 "It is rumored that Capone would hide inside the vault while authorities or enemies searched for him," the site says in its description of the new suite. The Capone Suite does offer "Complimentary WIFI, LCD Flat Panel HDTVs, hair dryer, iron/ironing board, alarm clock radio with iPod docking station." Just like Capone would have liked. And: "All of our spacious bathrooms feature walk-in showers or tubs with decorative tile, granite topped vanities, spa quality bath products and luxurious bathrobes." The hotel calls it a return to living large. Steve Rhodes is the proprietor ofThe Beachwood Reporter, a Chicago-centric news and culture review. He lived in Northeast Iowa for nine months a long time ago and actually likes Dubuque.